Imagine you are in a restaurant, hungry and waiting for your food to arrive. Finally, the waiter places a steaming hot dish in front of you. How does your brain decide whether you are going to eat this food or not? Which part of the brain controls your appetite? Dr. Pinky Kain Sharma is a neurobiologist trying to find answers to these questions at Regional Centre for Biotechnology in Faridabad. Her research group is working to understand ‘taste modulation’ using the fruit fly i.e. Drosophila melanogaster. Taste is extremely important as it allows the organism to evaluate and choose food. “By exploiting the gustatory (taste) system of flies, I want to understand how organisms use taste to make feeding decisions. We don’t have a clear picture how ‘taste’ is wired and processed in our brain, ” she said. Pinky’s team has its research lens focussed on two kinds of neural circuits – one that conveys taste information to the brain, and the other involved in acceptance or rejection of food. In a broader sense, her research aims to help identify novel chemicals and strategies for pest control to reduce agricultural loss as well as to reduce vector borne diseases like malaria, dengue, chikungunya etc. This is a relatively unexplored application of neuroscience. It is promising since insects like mosquitoes find their host using smell and taste. “There is a huge void between basic research in neuroscience and applications in industry. Keeping this in mind, I am pursuing novel research with the potential for developing commercially relevant technologies for the agricultural and pharmaceutical industry,” Pinky added. 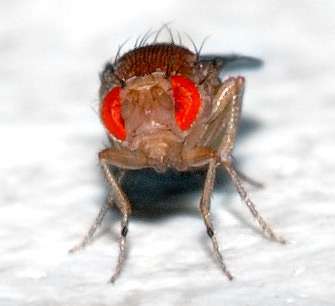 The fruit fly has been extensively used as a model organism to to study complex and fundamental questions in development, behavior, neurobiology, and genetic diseases. Drosophila tick all the boxes that make them ideal lab rats – a life cycle of two weeks, a diet of simple food, a 60% DNA similarity with humans, and convenient handling (they can be housed in tiny tubes). “Most importantly,” explained Pinky, “the Drosophila genome has only four pairs of chromosomes. Humans have 23. This makes it much easier to manipulate them and study the function of genes and understand how they interact. An experiment based on fruit flies can yield results in three weeks, while the same experiments with mice could take a year,” she explained. This is why Drosophila has played a key role in unravelling biological processes for the last century. This includes the ground-breaking research work on molecular mechanisms that control circadian rhythms which was awarded the Nobel Prize in Medicine in 2017. Pinky was born and brought up in New Delhi along with a brother and three sisters. In the family, all the men were engineers and the women were homemakers. Still, her parents were supportive of her ambition to become a doctor. When that didn’t work out, she decided to pursue biology. “My mother passed away in 2013 due to a severe dengue infection but still remains an invisible source of strength for me. Although she was not educated, she wanted me to study well and do something meaningful with my life”. Pinky completed her Bachelors in Microbiology from Ram Lal Anand College, Delhi University, and Masters in Microbiology from Devi Ahilya Vishwavidyalaya, Indore. During her MSc dissertation project at IIT Kanpur, she was introduced to the model organism of her choice Drosophila melanogaster. 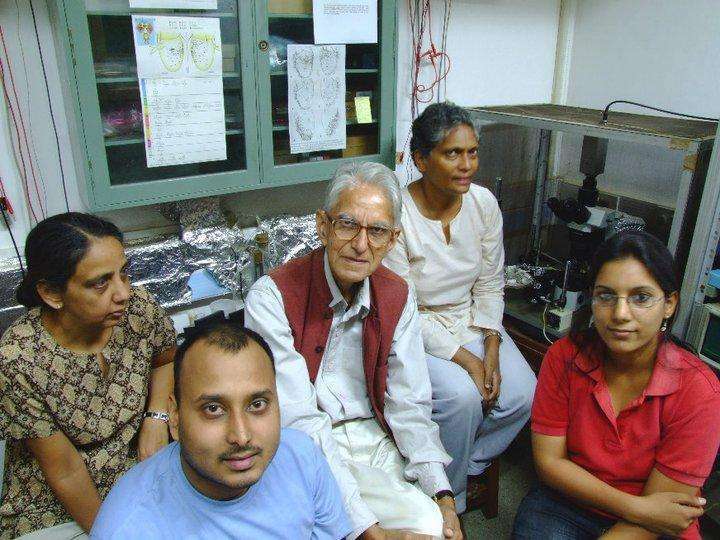 “I consider Prof. Pradip Sinha my genetics guru. He inspired me to pursue genetics,” said Pinky. Thus began her deep fascination with the organism and its potential as a human disease model. Later, she joined Prof. Veronica Rodrigues’s research group to pursue Ph.D in Genetics in 2003. Here, Pinky was part of a collaborative project to “understand the olfactory (smell) and taste transduction pathways in insects”. At NCBS, Pinky got the real flavor of neurobiology. The vibrant atmosphere there left a profound long-lasting impact on her. She gained access to state-of-the-art instrumentation, participated in international conferences and interacted with distinguished scientists. Pinky is full of praises of her mentor Prof. Rodrigues. “She always had an incredible attitude that nothing is impossible. If she was happy with your work, then she would provide you all the support,” she recollected. Challenging times came when Prof. Rodrigues’s health began deteriorating due to cancer. Pinky recalled how Prof. K. VijayRaghavan, currently the Principal Scientific Advisor to the Government of India, whose laboratory was next door at NCBS, took over as the support system for completion of all her projects. Eventually, Prof Rodriques passed away in 2010. In 2009, after completing her PhD from NCBS, Pinky went to Germany to pursue her first postdoctoral stint with a research group at the Institute of Neuro- and Behavioral Biology, University of Münster. She studied glial cells in Drosophila larvae. Glial cells surround neurons and provide support for and insulation between them. If the layer of glia is absent, then the neurons cannot fire. She decided to move to USA in 2011 for another postdoctoral position at University of California, Riverside – this time in chemosensory research, which was the area she focused on during her PhD. One of her projects there was “to identify central taste neurons in Drosophila brain”, a research theme which she had been wanting to veer towards. Results from her studies affirmed that research on taste coding and circuits involved are still ambiguous. She decided that she would explore this area in depth to further the understanding of how insects make feeding decisions and process taste. “The work was more demanding in the US. Considering that my postdoctoral guide was also of Indian origin, I felt there were additional expectations from me to shoulder responsibilities than other students in the laboratory. Nevertheless, I took it all in my stride”. The work that Pinky did in the US with her senior Dr. Anandasankar Ray was first published in the journal Nature in 2013 – and then retracted. The paper reported primary research which ‘identified neurons that render fruit flies sensitive to a potent insect repellent’. The journal retracted the paper on account of ‘reproducibility issues’. Pinky was the first author of the paper along with a number of authors. 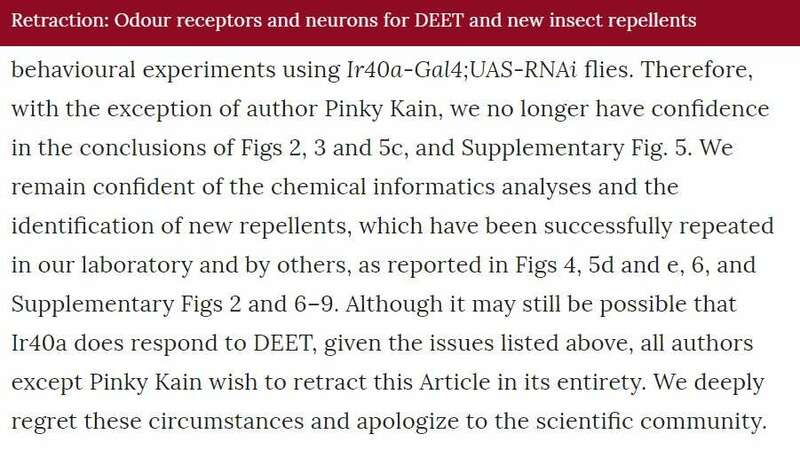 During the retraction – all authors except Pinky accepted the retraction the paper citing that they could no longer support the claims in the paper. Pinky, however, does not agree with the retraction and continues to affirm the data to be correct. “As the experiments performed by me were used to yield positive results, I was confident about the data. But, in the end, I did not receive the right support and mentorship from my senior. The controversy surrounding the retraction could have been dealt in a more cordial manner”. Meanwhile, like in any Indian household, Pinky’s parents and family wanted her to get married and start a family as she was approaching the age of 30. Pinky came in contact with her husband Sachin Sharma through the networking website LinkedIn. Sachin is a Ph.D in chemical engineering from IIT Roorkee. They got married in 2012 and Sachin joined her in US while she completed her post-doctoral study. In 2015, while still in the US, Sachin and Pinky had a son. Pinky’s maternity leave lasted for only 6 weeks. “I faced multiple challenges managing the baby, breastfeeding, laboratory duties and household chores while still recovering from the delivery without much family support. Though Sachin provided full support in every way, I went through a harrowing time during that period,” she said. Having decided that it was time to set up her own laboratory in India to conduct chemosensory research with Drosophila, Pinky started applying for fellowships. “We don’t want fly people,” was the response she often got from laboratories during this period. “The fly is a beautiful being, but lot of institutions were reluctant to work on fruit fly mechanism. The power of fly genetics is underestimated in India,” she said. Pinky could not understand the hesitation of the institutions in India to employ scientists working with Drosophila. After a very difficult year of paperwork and handling other issues, she joined Regional Centre for Biotechnology in December 2016. It took her couple of months to setup her laboratory. It has been a year at RCB where she now has five lab members. Her husband is also part of the lab. Pinky’s team has recently started work on a project to test the quality of water in Delhi NCR region through the feeding behaviour of the flies. She advises younger scientists and her students to utilise their time in the lab productively and pursue other activities in the evening. “Being a scientist can be very stressful and it is very important to spend quality with family, pursue hobbies, take meditation/relaxation breaks and exercise regularly.” She strongly feels that the new mantra for success is to have a work-life balance rather than just a work life. Pinky sees cultural roadblocks still existing for women in science and working women in our country. “Things have definitely become better for women professionals in India. But we have miles to go.” She feels that it will take some time for the society to change its perception of gender-specific roles and responsibilities for men and women. “I feel that institutions should provide flexibility in working timings and access to support facilities for raising children. Some women scientists manage anyhow driven by the fire in their belly, but additional support will help in plugging the leaking pipeline in science”. Pinky believes that if women scientists wish to be treated equally on par with their male counterparts, they also need to get out of their comfort zone and put in equal amounts of hard work and dedication. Whilst acknowledging the problems that cause people to quit science, Pinky highlights the importance of grit. “Even the airplane takes off against the wind and not with it,” she concluded.